1- Rent a car: at first we thought we could rent bikes to get around but I am so glad we rented a car. The property is “out of town.” and not close to a bus/train station. This was our first experience driving in Europe and the French country roads are fairly easy to navigate and there is not much traffic. 2- Monts is not a tourist destination, like Paris, and most people don’t speak any English. This wasn’t a big deal for us as we travel to France often but be prepared to bring some sort translation device. 3- Rent a phone from InsidrParis: Since the Mill didn’t have WiFi or a phone, we rented a phone from InsidrParis that we picked upon arrival at CDG. We used the phone as our navigation for the car, translator, and hotspot to call home. 4- Grocery shopping nearby: There is a SuperU in town but if you drive a little further there is a Carrefour which has more and better selection and BioCoop which has only organic items. All in all, it was a fantastic trip. We are looking forward to coming back soon. We were instantly impressed with the Moulin, it is a historic building tastefully restored into a beautiful holiday home, in the most amazing location. The moulin is stocked with everything you need and the attention to detail is evident. The facilities were excellent, from the pool to the games room, all well maintained and very clean. The owners of the estate were so welcoming and wanted to ensure a happy stay. It was a very child welcoming environment. The kayak was used for a trip down the river Indre and safety equipment was provided. The moulin is ideally situated for day trips throughout the Loire Valley, and it’s many beautiful chateaus. The nearest town Tours has a gorgeous old town that is very much worth a visit. We would very much recommend this for a relaxing, family orientated holiday. Peaceful, private, idyllic setting — it couldn’t have been more pleasant. The moulin is a delight, a perfect romantic getaway spot. It’s spacious and well equipped. Listening to the Indre River day and night was both relaxing and invigorating. Though it is tucked away on the grounds of the estate, the moulin is nevertheless very conveniently located for Loire Valley touring. I’d return in a heartbeat. From check in to check out, a totally new experience for us. the silence, the peace, the relaxation is equal to none. All that we needed and more, very much attention to detail, dream bedroom, larger than our home, candles, wine, the sound of the river, the secludeness, I do not know where to start. Fishing from the terrace was amazing. Thank you Anne for a wonder experience! Lovely mill, ideally situated and well equipped. Very comfortable. 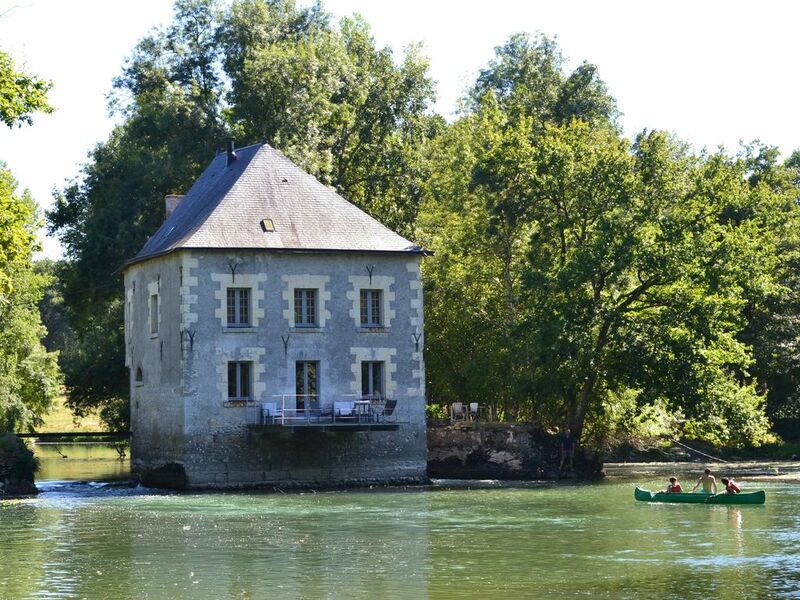 The mill is a wonderful place to stay, lovely and quiet but nicely situated for visiting the Loire. The mill was very comfortable and well equipped and the owner was very friendly. A great place to stay and would not hesitate to book again. A lovely mill set in the country side ,just sit on the deck and enjoy . Just get the shopping in ,no need to visit anywhere else. Row the boat down the river and see king fisher , swimming grass snakes ,fish and fowl .Watch meteors ,and RELAX. Every thing you need is in the mill lovely wood burner with logs supplied.bed great ,shower great,toilet great ,all great. located only 55 minutes from Paris by TGV, and TGV rail station 20mn from the "St Pierre des Corps"
From Tours, take direction Joué les tours, then Monts, (15kms south from Tours) by the D86. In the village "Monts", after the bridge over the River Indre, on the stop, turn right direction Artannes. Above 200m, in the traffic circle, enter the domaine du Breuil in the woods. Le Breuil is the perfect starting point for a stay full of discovery, nature, culture, gastronomy and leisure activities. You can also try yourself at fencing at the Château des Sablons, take cooking lessons at the Château d'Artigny or at the Tortinière, act in a play at the château de Gizeux, discover a corner of Poland you That Settled at Montrésor, watch a pack of hunting hounds at the château de Champchevrier or at Montpoupon, black tomatoes taste at the Bourdaisière, admire the gardens at the Chatonnière and the forgotten vegetables at Valmer, with fairies revel at the château du Rivau, climb Into a Chinese pagoda at Chanteloup, dig Into prehistory at le Grand Pressigny, relive the Duke of Windsor's wedding to Wallis Simpson at the château de Cande. In all there are around 30 sites open to visitors ... Within a very short distance!